I am available for full percussion arranging, as well as battery/front-only writing. I will take each group’s needs into account when designing. Band size, instrumentation, performance venues, skill level, etc. all factor into my writing process. Professional looking PDF parts and scores. 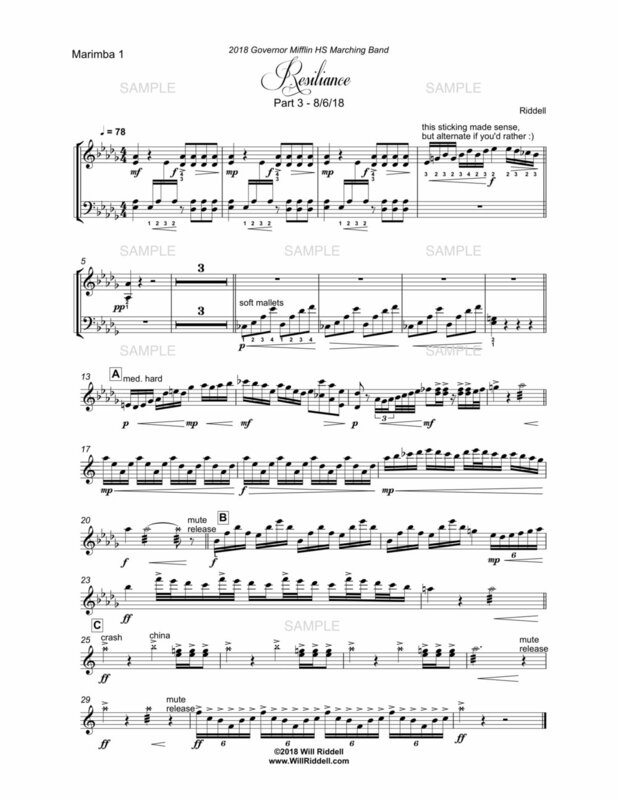 Default format is landscape for scores, portrait for individual parts, but I’m flexible. Stickings, permutations and buzz roll skeletons are written in for almost everything. Auxiliary (rack) percussion parts have all instruments indicated through text and notehead assignments. General or brand specific mallet selections can be included, if you’d like a jumping off point when crafting your sound. Synth parts as needed. All parts and scores are dated, so you know you have a current version. Tired of getting a multi-page part where the last page only has one or two bars on it? Me too. Also… NO TIMES NEW ROMAN! Because life is too short to use default fonts. MP3s of the battery and full percussion section with click track, created with Virtual Drumline 2.5.5. I can create recordings with wind parts integrated if provided a .sib or .xml file, or from a PDF for a nominal fee. If you want an individual part with a met for practicing, that’s no problem either. “Punk Rock Pricing” - Art lives? I’ve experimented with this a few times over the years and it always goes well, so until further notice I am implementing a “pay what you want” policy. This means that my arranging fee is totally up to you. If your program truly and honestly can’t afford to pay me anything, so be it. Are there catches? Sure there are, but I think they’re pretty reasonable. Number one, and probably most important, all copyrights and permissions must still be paid for. I have no problem giving away my work for free, but that artist whose copyrighted material we’re using… they care, and so does Tresona. Secondly, since there’s a finite amount of Will-power (oof), I reserve the right to give higher priority to paying clients. I don’t want this to turn into some sort of bidding war, and I don’t want to use this as leverage to try and squeeze money out of anyone. I’m simply covering my bases in the situation that I get more requests than I can handle and have to choose who to take on. Obviously I will consider other factors when making this kind of decision. Lastly, and this applies more to Indoor, please don’t devalue my work just because I was generous with it. What I’m getting at, is that I’d really prefer you not re-distribute anything that I created for your group, such as PDFs and MP3s. Be cool, Honey Bunny. And that’s it. Look, I love that people pay me money to write music. It’s a great feeling. But at the end of the day, it isn’t what drives me. My number one priority is making art with cool people. If you feel the same way, let’s chat. I currently have a few options available if you are interested in a full marching band show (percussion and winds). Email me for more info.